Electronics Costs > How Much Does Ground Penetrating Radar Cost? Ground penetrating radar, also known as GPR or impulse radar, is an electromagnetic technology operating on the physics of the earth to capture images of the subsurface using pulses from the radar. This technology is diverse and can work on pavement, rocks, ice and even freshwater. This technology was first used in the early 1970s when several different teams of scientists began to develop radar for viewing into the earth. This radar was first developed for military applications such as locating tunnels under the DMZ between North and South Korea. Most of the time, these machines are purchased by companies rather than by individuals. Traditionally, a GPR system can cost anywhere from $15,000 to $90,000 brand new. A simple system will tend to be less than $10,000, while those that are over $35,000 will require an experienced user. For instance, a forum member on this TreasureNet.com forum thread claimed that they saw a GPR sell for $3,600 on eBay. Another forum member on this same thread claimed that you should be prepared to spend at least $30,000 on a brand new device. AccurateLocators.com, for instance, sells a unique GPR and the software for about $15,000; however, the antenna system will have to be purchased separately. The average antenna, depending upon the frequency, can cost $2,500 to as much as $6,500. US Radar, Inc., according to their official website, starts pricing around $14,000, depending on the specific model. The costs include the cart, tablet, battery and the software to do basic utility locating. On eBay, we were able to find slightly used radar equipment for $8,000 to $12,500. 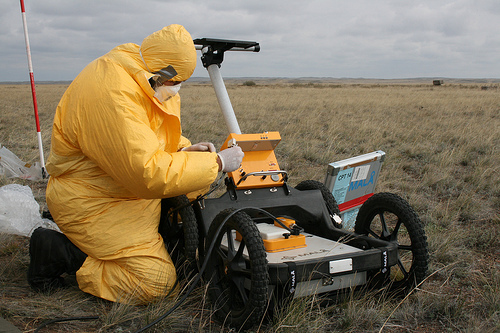 Ground penetrating radar operates on polarized radio waves of a noted signal which are thrown at the subsurface structure; if these waves hit a body with a differing dielectric constant, which is the proportion of a body in a distinctive medium to that of the body in free space, the antenna collecting the return signals acknowledges a difference in the returned signal. Depending on the model, this device can reach as little as a few inches to as deep as 75 feet. The depth will greatly depend on the type of antenna you are using. To use ground penetrating radar, software and a laptop will be needed, in addition to the GPR. If the software does not come with the device, you may have to spend an additional hundred dollars or so to buy it. This software will target the information from the device and set it to a map. This software can also help locate utilities and mark certain areas. Using a laptop is important as well since you will need to be able to interpret the results of the GPR on the go and directly at the job site. Accessories, such as additional antennas or a survey wheel that can control the readings, can cost $600 or more. Advanced devices will often require an experienced user. Those who do not know how to use the device will often have to consider taking classes to learn how to operate it. The frequency will determine how deep a GPR can go. A very low frequency can see very deep, but a high frequency can only see shallow depths. Before purchasing this type of device, know what kind of surface you are going to be using it on. Grass, for example, will need a lower frequency, while something solid like concrete will need a higher frequency. The one you choose should also be determined by the job you are performing. If you are only digging a few feet underground, then you will be able to purchase a cheaper one that has a higher frequency. It is popularly known that GPR was used in 1972 to uncover the 150,000 pounds ransom fee Michael Sams hid in a field after taking an estate agent hostage. A GPR does have its own limitations. All makes and models are not created equal, so be sure to carefully examine its specifications before making a purchase. The type of GPR you choose is very dependent upon the surface as well as the depth. Lower frequencies will penetrate deeper, but higher frequencies are needed to penetrate surfaces such as concrete. GPR is known to be very efficient, although its depth range is dependent on the depth of the subsurface, the power radiated and the frequency of the transmitted center. Most devices will not be able to tell the shape or what type of utility is buried beneath the ground; it will simply tell you that something is there. While it may be rare to find, keep your eyes peeled on eBay and Craigslist for second-hand models. Purchasing second hand can save you hundreds, if not thousands of dollars. Services, depending on the job size, can charge anywhere from $300 to $2,500 a day.